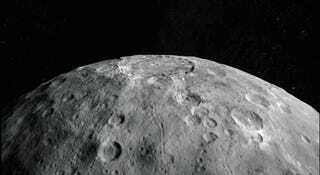 A breathtaking new composite video tracks the journey of NASA’s Dawn spacecraft as it settles into an orbit some 2,730 miles (4,400 km) above the surface of Ceres. Dawn entered into its new orbit on June 3. The spacecraft will stay there for about a month as it continues to conduct detailed observations of the surface. The new fly over video was compiled from 80 different shots as Dawn made its approach, as well as recent images taken from a distance of 3,170 miles (5,100 km). The video offers a unique 3D perspective of the dwarf planet, showcasing its heavily cratered surface and highly irregular shape.